Best TV streaming boxes 2018 | What Hi-Fi? Even if you don't have a smart TV, you can still get streaming - all you need is a suitable streaming device. Nowadays they're smaller, cheaper and more feature-packed than ever before. Some can stream in HD and 4K, too, providing your broadband connection is up to it. 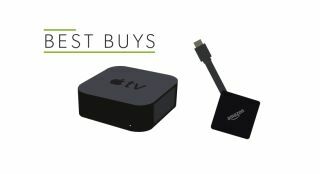 The cheapest Now TV box outputs 1080p Full HD and can serve up 7.1 surround sound - it's the obvious route to a smorgasbord of catch-up TV and Sky content on a budget. Amazon's latest Fire TV Stick is a stone-cold bargain. It even boasts Alexa, Amazon's voice-activated personal assistant. "Alexa, show me something good!" If you're happy spending a little more, take a step up to the Fire TV box. 4K video, a speedy UI and expanded storage options make it a great choice. Apple finally added 4K to its streaming box of tricks. The 32GB model can be yours for £179, the 64GB £199. A little bit quirky and not perfect in every respect, but the One X is still a box of many talents and supports 4K streaming from both Netflix and Amazon Prime Video.